Decisions, decisions. 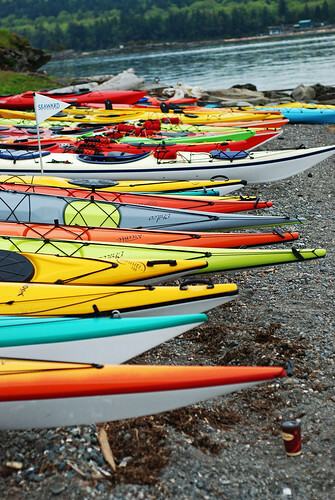 Today I drove up to Ladysmith to experience Paddlefest at transfer beach. All I can say was I was impressed with the whole event. Lots of vendors with lots of gear and lots of patience. It was a great place to really set to the task of figuring out what bit of kayaking gear was next on the list. 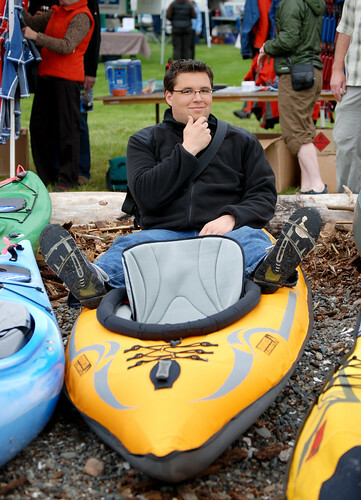 Last year, I was planning to buy a boat from this very event and if my boat hadn't fallen into my lap with a well timed Craigslist posting, I really would have bought exactly the same kayak. :) I tried every kayak my size on the beach, and the update version of my boat was still the best fit - though the Seaward Infiniti 155 TX has some things going for it. We arrived right at opening time and the water was calm with a slight hint of breeze from the southeast. 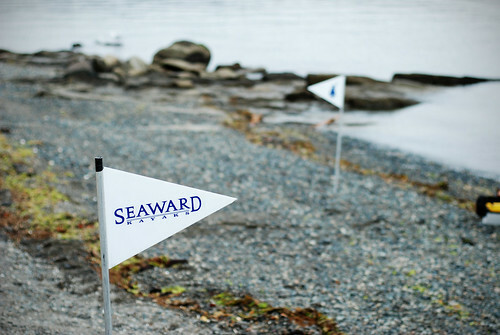 I bumped into an old coworker of mine, Nick Horscroft, who is now taking care of sales for Seaward. We talked a bit of shop while he was helping a couple fresh kayakers pick out a new boat from the British style catalog. The water area was full of boats of all styles from plastic recreational boats to Hobies with their strange propulsion systems to full kevlar layups (being dragged mercilessly across the rocks by people who didn't know better). 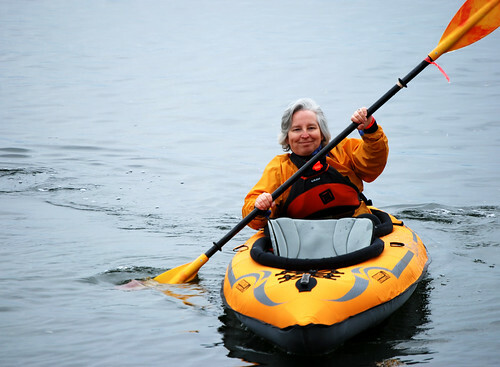 Paula took out a tandem inflatable kayak to see how it would maneuver for some friends. I could barely squeeze into the thing, but a 6'4" guy in the back and 5'2" in the front might work as long as the shorter person doesn't mind you using their lower spine as a footrest. Louise took to the water immediately trying out a new 16' delta thermoform. I walked around and had a gander at all the 'yaks on the beach and had a sit in one of the most gigantic boats I've tried yet, the CD Solstice GT Titan (this was the LOW VOLUME version). It is honestly made for huge, and I mean huge paddlers in both directions. I got in it and i could have probably rolled up and slept in the cockpit. I tried one of these last year, where I complained mostly about the really high deck, but this model was -intensely- larger than I remember. I guess there's a kayak for everyone, now. If you're over 300# and tall, this may be your match, if you're neither of those, you won't see over the dash. The party was in full swing, so I decided to finish taking photos and get changed into attire for the water. I had paddles to test today (and I took out some different boats too). The mission was to compare various paddles starting with the lowest priced ones and going up to full carbon awesomeness. I got back down to the water and took out an Atlantis Titan with two nimbus paddles, both in graphite. This combination probably wasn't the best as i had to paddle hard for very little forward movement. Not really my style of paddling, so i started to look for longer touring blades from Aquabound - makers of my current paddle. I took a few of their paddles out in the Solstice GT Titan LV. As I said before, that boat's deck was simply too large and too high. I hit the 220cm paddle on the side of the boat with any notions of "high angle padlding" or "stern rudders". I returned it and took out the telkwa and tried testing thee paddles again. They were okay, very similar performance to my current paddle, just a small weight difference. It was time to step up to the more expensive paddles. I wandered over to MEC's booth and tried out a Lendal kinetic touring S with a cranked handle and then wandered over to the seaward camp for a go at the Infinity 155 TX. I got in the boat and thought, "hrmrrm...tippy," but that got erased as soon as I started turning it on edge and being less of a cork on the water. I kind of liked it after even a 10 minute ride - I'll have to kick the tires on a 175 sometime and see if length has anything to do with initial stability. The Lendal was a nice paddle, just a great feel, felt like it belonged in my hands. Never got my hands close enough together for the cranked area to actually mean anything. If anything, I'd say that a wide handhold on a cranked paddle will transfer a lot of the strain to your fingers, though it'll remove the strain on your thumbs and wrists for sure. I moved to Werner paddles, starting with the Athena. The Athena behaved oddly on waves, perhaps it wasn't the right shaft length or something like that, so I decided to try the Camano in resin and it ended up being my favorite with the Kalliste in carbon being a close second. I guess I'm a low angle fan after all. As I was testing the Werner paddles, I got the opportunity to test out a greenland paddle from a friendly paddler, George. It's a totally different paddle experience and man is sculling ever easy with that paddle style. Didn't feel as fast to me, but greenland paddles are whole different mindset with a whole lot of other skills to learn beyond a 5-10 minute demo session. I think I'll set to building a GP soon as well as picking up a Camano in resin with a straight shaft to replace my aging paddle. I wrapped up my paddle test and got changed for lunch. We had a great meal at Renee's in Ladysmith and we were back to the shoreline while everyone finished up courses and oggled various boats on the shore. 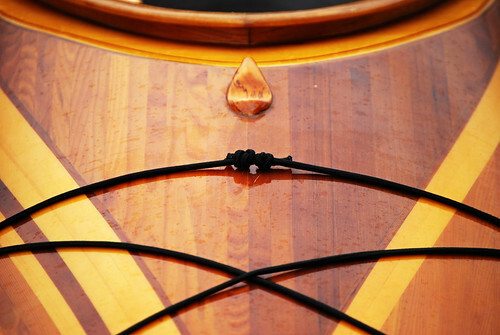 The pic above is from a beautifully crafted wood boat near Sealegs. Everyone assembled to look at the handiwork wondered how on earth anyone could put it in the water (where barnacles and rocks live). As the night came to a close, the rain rolled in. We headed for dinner and then back to Victoria. I hope to get out kayaking sometime during the week, looks like we're in for a bunch of nice weather. 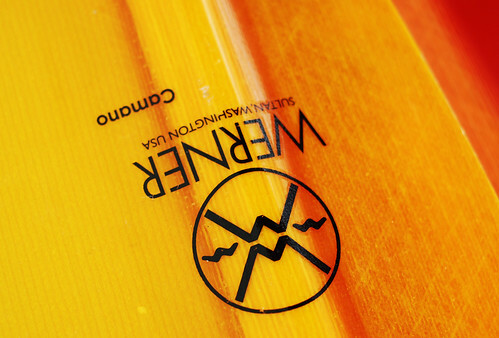 It was great to experience paddlefest, and I hope to make my local Werner rep happy in the next little while. Thanks to everyone who made the event flow so smoothly.